With the 2017 OFC U-17 Championship just around the corner Fiji and Papua New Guinea went neck-and-neck at Mt Smart this afternoon but couldn’t be separated after 90 minutes with the score remaining locked at 0-0. The two sides are in Auckland, New Zealand preparing for the regional competition which gets underway on 11 February in Tahiti. Despite being unable to find the back of the net on this occasion, Papua New Guinea coach Harrison Kamake was proud of the performance shown by his young side. “We landed in Auckland at half past two this morning so I’m happy with the result,” he said. “We just need to go back and identify things we need to improve on in the other friendlies coming along,” he added. With only a few months given to Kamake to establish the squad, he is relying on upcoming games to build the team’s experience playing together and identify the weaknesses in the squad before their first match. “We haven’t had much exposure so these friendlies here are very important to the team to see where we stand, what to work on with our weaknesses and what to work on with our strengths too,” he said. Fiji coach Shalen Lal was impressed by his team’s battle despite the scoreless result and was glad to be able to find areas that need touching up well ahead of the competition in Tahiti. “This was the third game that we’ve played in and this game has given us more areas to work on. The areas of concern are probably in defending and we identified some problems in the midfield area,” he said. “I think the intensity of the football was high but there were areas that we have worked on in training sessions that the boys were not able to put together in the game,” he added. “Three games in I think fatigue has set in a bit, but I think they played a better second half than they did in the first half. Lal said the score is not the main focus for coaching staff at the moment as they focus on preparing a well-rounded squad for the FIFA U-17 World Cup qualifier. Papua New Guinea has been drawn in Group A against hosts Tahiti, Vanuatu and New Caledonia. Their first clash will be against New Caledonia in the opening match of the competition on 11 February. 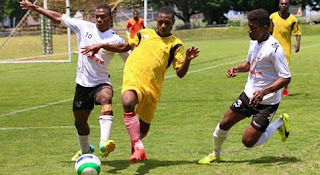 Fiji has been drawn in a tough group against defending champions New Zealand, as well as Samoa and Solomon Islands. Their first match will be on 12 February against Solomon Islands.